The largest in-progress mega-project in Egypt is being completed now in the heart of Greater Cairo. The Egyptian Refinery Company (ERC) is a $4.3 billion facility, and when it comes online in 2019 it will be capable of producing 4.7 million tonnes of refined oil products and derivatives per year. It is the largest public-private infrastructure project in Africa, and when Qalaa Holdings and partners closed financing in 2012, it was the largest equity raising in the Middle East and North Africa (MENA) region. The construction site is awe-inspiring: soaring superstructures, out-of-scale vehicles and cranes, and a city of workers. At every turn, you see an incredible display of coordination, expertise, and boots-on-the-ground hard work. I am proud of the project’s scale, but also of what it represents. ERC is a cornerstone of Egypt’s economic security, providing real environmental benefits and improving the lives of thousands. As the founder of Qalaa Holdings, my contribution, when you compare it to the excavating, hauling, welding and other on-site activities, consisted mainly of hours on the phone and probably a few weeks of sitting in boardrooms. It is less glamorous but necessary work. A mega-project like ERC does not happen without commitments from a broad range of stakeholders, investors and lenders. The project spent more than five years in development and weathered, among other things, the 2008 global financial crisis, the 2011 Egyptian Revolution, a devastating tsunami in Japan (home to key backers), and ongoing Eurozone banking challenges. To succeed, Qalaa Holdings called on a deep network of investors, banks and guarantors. Compelling fundamentals and unwavering support from the government were key. The fact that we were able to keep a broad spectrum of public and private stakeholders engaged is a testament to the project’s economic strength and the stakeholders’ commitment to Egypt’s economic and political development. So, is ERC a private-public-partnership (PPP) success story? Absolutely. But perhaps not for the reasons you might think. Most of the discussions I participate in about PPPs are about financing. There is talk of “synergy”, “co-leveraging” and “multi-sector cooperation”, but it is all in service of getting the project off the ground. It is about how projects of this ambition are not achievable without public-private partnership. Now that ERC is nearing completion, my perspective has shifted. When I don my hard hat and walk beneath the superstructures of piping and scaffolding, and more importantly, when I meet the people who wear a hard hat every day, I see PPP benefits that extend through the full lifecycle of the project and beyond. For me, these are innovation, sustainability and inspiration. ERC recently installed a Korean-made, 1,280 tonne hydrocracker unit (HCU), the largest piece of equipment ever to enter an Egyptian port. All down the line, managers, engineers and workers have innovated solutions to new obstacles, and getting the HCU from port to installation was just one. ERC is leveraging state-of-the-art technology at every turn, transferring high-tech knowledge and experience to thousands of local workers. 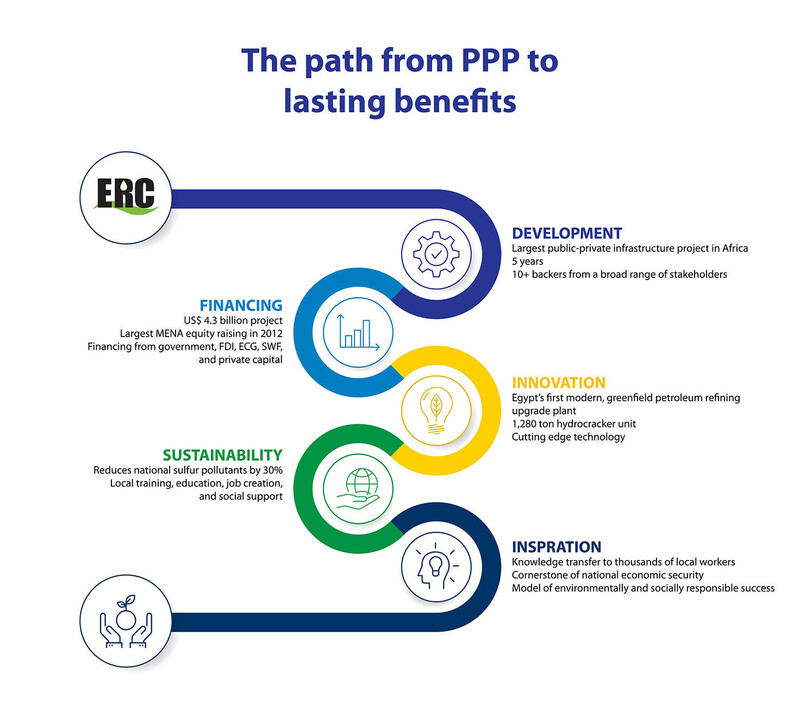 ERC’s public-private partnership is innovative as well; it is a blended financing solution that includes direct foreign investment, export credit agencies and sovereign wealth funds, in addition to government and private-sector support. All mega-projects require numerous first-ever solutions, and in my view, these innovations born of necessity convey benefits that surpass any innovation taught in a degree program. In industry, sustainability is most often seen through the lens of an environmental and social impact assessment (ESIA). ERC conducted a rigorous ESIA that resulted in numerous initiatives, and we are confident of ERC’s economic, environmental, and social sustainability. Environmentally, ERC will reduce Egypt’s sulphur emissions by almost 30% by supplying the local market with clean (Euro V standard) diesel. Socially, ERC’s development programme is providing training, education and jobs for women and youth, helping the physically challenged and supporting local social workers. One of the clear benefits of PPPs is that no element of an impact assessment is minimized. When everyone has a stake, all contingencies get covered. But there is another view of sustainability. I expect ERC to operate for a long and productive lifetime, but nothing that lasts is static. Where will the talent, leadership and expertise necessary for ERC’s evolution and growth come from? At ERC, local staff work alongside dozens of nationalities, including Americans, South Koreans, and Australians, with years of expertise in the refining and construction sectors who are transferring industry knowledge to thousands of local workers. ERC is sowing the seeds for its own future. The size of its workforce and its geographic area truly make ERC akin to an entire city at work, mobilized by a shared vision. Of course, these workers all come from their own communities, where they have families and extended families. Of ERC’s current 8,200 employees, 30% come from Mostorod where the project has its home. ERC is having a huge impact there, but even positive impacts, at scale, can be disruptive, so we act on our responsibility to our host community with enthusiasm. ERC is funding education, and our community needs assessment produced a programme of socio-economic projects. Trainees at our Welding Training Center include pipe fitters and mechanical and electrical technicians. Women are receiving computer training, and cell phone maintenance is also being taught. We refurbished three schools and ran environmental awareness campaigns in five; our youth forums reached 5,000 stakeholders. What do falling oil prices mean for Egypt? These efforts are helping to improve the prospects for the community, but empowering a community requires more. Projects that do no more than throw resources at a need - even training - are susceptible to failure. What mobilizes someone to take up a new opportunity? The answer is inspiration. For the families of Mostorod, ERC is not a vague, distant benefactor. It is a member of their community, a real opportunity for their meaningful contribution, and - I hope - an inspiration for what they and Egypt can achieve. It is difficult to understate the transformative impact of this mega-project. ERC will eliminate one of Egypt’s import dependencies, improve the country’s air quality, contribute to better trained and more competitive women and youth, and model an environmentally and socially responsible project. But because of its scale and the partnerships required to make it work, it is also instilling innovation in workers and communities, it is planting seeds for its own long and sustainable future, and it is sharing this vision to mobilize others.